I personally love occasion and I find that Valentine’s day is a wonderful day to express love to your loved one. So here I am with my Surprise Inside Valentine Cake / Hidden heart loaf cake for my readers. I tried to keep it simple and handy. 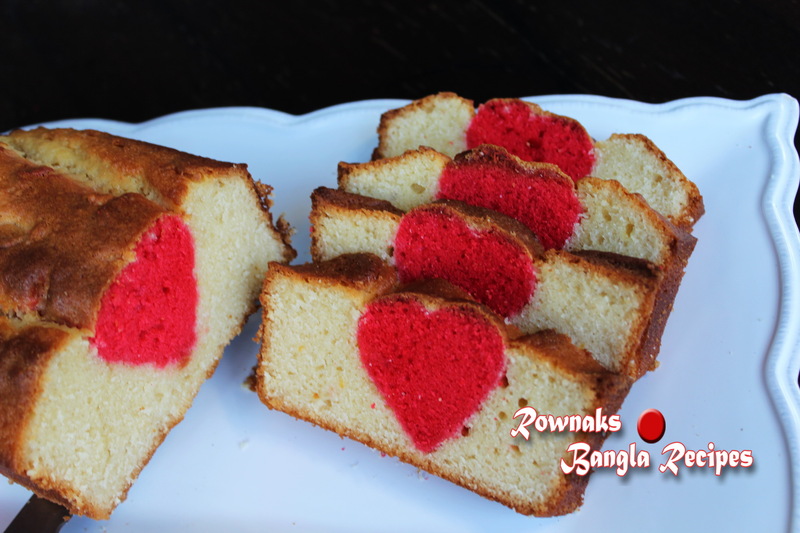 If you don’t have heart shape cookie cutter, you can cut heat shape hard paper and with help of that paper cut heat from red cake (which will be time consuming but not impossible and I believe that Bangladeshi people can do anything <3 <3). Also need a loaf pan, heart shape cookie cutter and spray oil or oil for brushing the pan. Sift flour, baking powder, baking soda and salt together. Spray or brush the pan with oil and keep aside. Preheat the oven to 180̊C or 160̊ C fan force one. Beat sugar, oil and butter together in a large bowl. Add eggs in one at a time and beat. Add vanilla essence. Add flour mixture and milk alternately a little at a time until well combined (Batter should be nice and fluffy). Take about a 1/3 of the batter and place in a bowl. Add red food colour to the batter to get a nice shade of red. Cover plain batter and keep it in refrigerator. Put red batter in baking pan and bake it for about 25 minutes or until a toothpick inserted in the centre comes out clean. Remove cake from pan and allow cooling completely. Cut out heart shapes from the red cooled cake with a cookie cutter as many hearts as you can. Stack as many as you can flush together, so you have a long row of hearts — essentially one piece. Pour a small amount of the mixture onto the bottom of the prepared pan. Arrange the hearts closely together in a row in the mixture. Fill pan with the rest of the mixture. Bake it for about 35 minutes or until a toothpick inserted in the centre comes out clean. Once cooked remove from the oven and leave to cool as before. 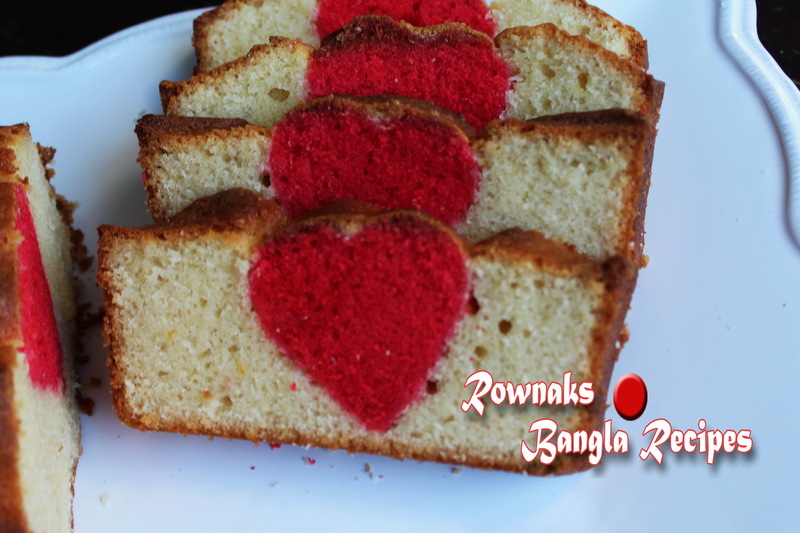 Enjoy Surprise Inside Valentine Cake / Hidden heart loaf cake. Hi.I’m new in cooking.trying some new recipes and cook them.now I’m interested in baking.want to make cakes.can u plz suggest me instruments and ingredients which I need to purchase for cake making? And few beginners cake recipe.